First up, if you're reading this in America, please note that when we say, 'American style fridge freezer' we mean 'fridge freezer'. Yes, Europeans are so backward that they consider a big fridge freezer with two, side-by-side doors to be impossibly exotic and foreign-seeming. Clear? Good. Now, if you have the space, need a lot of food stored, and also like to be able to dispense ice cubes and chilled water whenever the whim takes you, the best American style fridge freezers are the 'hottest' kitchen tech around (nb: they are not actually hot; that would be ruinous for the foodstuffs within). When it comes to chilling foodstuffs, you have several other options at your disposal, of course. You could opt for a larder-style fridge along with a separate freezer unit or a fridge-freezer with the doors above each other – that's the most popular configuration. American-style fridge freezers: what are they? It’s no secret that Americans like their food. Hence, when they go shopping they don’t just stock up on a piddly carrier-bag’s worth, they buy enough to fill a 4x4. Given that so many US products are sold in large quantities – ice cream, for instance, is available by the gallon – they will need somewhere to put it and a wardrobe-like, twin-access all-in-one fridge/freezer is the only style of refrigerator large enough to accommodate it all. Trouble, is American-style fridge-freezers are extremely wide – around 85cm on average against the usual 60cm width most of us are familiar with – and usually bloody expensive, too (over a grand on average). But when it comes to practicality, storage space and kitchen kudos, the American-style refrigerator is the monarch of domestic white goods and one of the best ways to tell your guests that you’re really loaded and that your kitchen is much bigger than theirs. American-style fridge-freezers use the same compressor-based technology as normal-sized models, only in most instances they also feature a raft of other clever tech like full air circulation to prevent the build up of frost and fancy 0˚ fruit and veg drawers for optimum long-lasting freshness. They also quite frequently feature ice cube dispensers, chilled drinks dispensers and other fun, dispensing-based gimmickry. What is the best American-style fridge freezer? Needless to say, the best American fridge freezers are made by… the Germans, Koreans and Chinese. Our top spots are taken by the sophisticated Neff N50 and the rock-bottom priced Chinese Haier HRF-521DS6, although we also like the futuristic Samsung Family Hub. The mid-priced Neff N50 boasts an ample 370 litres of fridge spaciousness and a 163-litre freezer capacity – more than enough room for even the most ravenous and big boned of UK households. Unlike cheaper fridges and freezers that are invariably furnished with brittle interior plastics that can crack if mistreated, this one comes with high-quality rigid plastic drawers that don’t bend and twist even if loaded to the brim. The fridge cavity is fitted with four glass shelves, two fruit and veg drawers and another four shelves and a large lidded container in the door. The freezer, meanwhile, is comprised of three deep shelves, a pair of drawers and four mini door shelves for oft-used items. Everything is kept frost free by dint of Neff’s efficient MultiAirFlow cooling system. The plumbed water and ice-making system is a doddle to use and includes provision for both cubed and crushed ice. The water/ice system and all fridge and freezer settings are controlled via an easy-to-navigate flat-buttoned electronic control panel that looks ultra snazzy and meaningful. If you’re brand savvy and yearn for a slab of well-made German engineering, then waltz right this way because they don’t come more elegant and sophisticated than this stylish hunk of black Teutonic splendour. American-style fridge freezers are perfect for large families, frozen food fans and anyone who simply wants the ultimate two-in-one refrigeration system. However, they are notoriously expensive to buy, which makes this budget-priced 518-litre model from China all the more enticing. A Which? Best Buy, this Haier has more than enough interior 'meal estate' for your voracious needs and features key benefits like no-frost freezing, full air circulation in both the fridge and freezer compartments and rapid air cooling for newly added groceries. The fridge section comes with a considerable 341 litres of storage, with four shelves, two large salad crisper boxes and three large shelves in the door. The frost-free, 177-litre freezer is equally well equipped with seven compartments (two closed) and four large shelves in the door for frequently used items like frozen fruit and ice cream. To the untrained brand-spotting eye, the silver-clad Haier looks much more expensive than it is – an asset doubtlessly helped by the subtle logo that refuses to draw attention to itself. +Excellent cooling tech +Extra large +Wi-Fi connectivity and interior cameras! Looking for an in-your-face, over-the-top, bells-and-whistles model pulled straight from the scene of a sci-fi movie? Then catch an eyeful of the gargantuan Family Hub from Samsung. You can’t miss its standout feature: that huge 21.5-inch Android tablet slapped on the right front fascia provides useful access to the entire web plus a raft of apps for shopping lists, calendars, recipes, messages, photos, timers, radio stations, even a drawing board for the kids. It also supports Bixby, which means you can now, in reality, talk to your fridge like Hal 9000 from 2001: A Space Odyssey and ask it questions. Hopefully, it will not then attempt to kill you, like the actual Hal 9000 from 2001: A Space Odyssey. The fridge compartment also has a trio of internal cameras that stream images to your phone so you can see what needs stocking up while perusing the Waitrose aisles. Okay, so that bit borders on useless, especially if large products in the fridge are obscuring smaller ones behind. But hey, if the technology is available for a fridge camera or three and you’re inclined to use them, then why not? Problems may come a few years down the line if software updates aren't maintained, or the cameras break, but hopefully that won't happen. The energy-efficient Family Hub comes with 593 litres of internal storage (fridge 383-litres, freezer 210-litres) and measures 91.2cm in width, 1.78m in height and 72cm in depth, so you’d better make sure you have the acreage to accommodate it. Fridge-tech wise, this model has the works: independent frost-free cooling systems that waft cool air around both cavities, a digital inverter compressor that varies its power output, saving on bills in the process, a power freeze and cool function for rapid chilling of freshly loaded produce and a plumbed ice and water dispenser. Slap this splendiferous monument in your kitchen and you can be sure you’ll be fiddling about with its connected functions till the cows come home. Your partner, of course, will soon tire of this addiction, an argument will erupt and then you’ll divorce. Don’t say we didn’t warn you. This colossal, Italian-designed Smeg Americano is split horizontally rather than vertically. Despite differing from the norm, it’s a much more convenient configuration for day to day dipping in and out because the whole fridge section is at eye level while the lesser used freezer is positioned at shin height. This configuration also provides more fridge space (in this case a whopping 396 litres) at the expense of a smaller freezer section ('only' 154 litres). The fridge opens like a wardrobe and features identical interiors on both sides so you could feasibly load all your most used items on one side and leave the other side to the stuff you use only occasionally. Smeg’s active blue light and enclosed 0ºC vegetable and fruit drawers are said to ensure long lasting freshness, and who are we to disagree? Down below, the two-drawer frostless freezer compartment is comprised of a spacious lower drawer for large items like Christmas turkeys, legs of lamb, bags of French fries etc, and a compartmentalised upper drawer for smaller goodies like ice cream and frozen fruit. Smeg gear is not necessarily the most affordable on the market and this model is no exception. However, there’s no denying that it looks a zillion quid in all that glorious silver and the distinctive horizontal division between fridge and freezer is clearly an attractive feature. It’s also reassuring to know that, judging by online reviews, its small raft of (wealthy) owners have nothing but positive things to say about it. -Remind us, what IS the point of a magic, disappearing window on a fridge? 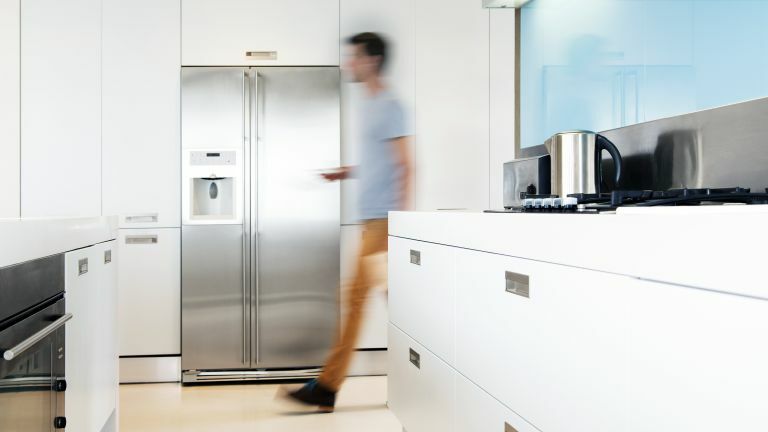 This distinctly snazzy 601-litre LG Instaview model doesn’t have the connected tech of the Samsung Family Hub but it does allow you to peer into part of the fridge section without opening the door and disturbing the chilled air within. Simply tap a couple of times on the dark frosted glass panel and it becomes magically transparent, showing you what’s inside. Aside from not letting any ambient air into the fridge (hardly an issue given that every fridge manages to cope when the door’s open), we can’t really think of a reason why you’d need this. Perhaps it's so you can pretend that your food is Hannibal Lecter, and this is its cell. The door-in-door design, on the other hand, is a more useful energy-saving feature, because it separates most-used items like milk and juices from the main compartment. Hence, when you want some milk for the cereal, simply open the small outer door and the main refrigerated cavity is left undisturbed. The LG also features a filtered air circulation system that ports fresh air around both fridge and freezer cavities, keeping odours and frost at bay. The FreshBalancer salad compartment, meanwhile, lets you adjust humidity levels so everything is kept at optimum freshness. And, because the whole thing is wifi enabled, you can adjust overall temperatures or be notified that you’ve left the freezer door open using LG’s Smart ThinQ app. A plumbed still water and ice dispenser with crushed ice facility tops off a handsome, low energy package that will nonetheless appeal rather more to rich Hampsteadites than committed environmentalists in yurts. Available in cheaper silver or pricy black.